Whole Life vs Indexed Universal Life: Life Insurance 101 – Innovative Retirement Strategies, Inc. There is a lot of fear-mongering about life insurance on social media. The Whole Life guys are bashing IUL. The IUL guys are bashing Whole Life. Securities guys are bashing life insurance. I don’t know what your motive is in making such a blunt statement without providing any facts to substantiate your claims. I’ll bet that 95% of agents making these claims are simply repeating the company’s sales pitch without understanding the underlying mechanics of the products they sell. Is there anybody out there that understands how both policies really work and can give an unbiased opinion? In this post I will show you that the hype is wrong. Anyone who says that UL/IUL is junk simply doesn’t know what they are talking about. If they did, they would never make such a silly blanket statement about an insurance product. Each product has pros and cons. People buy insurance for different reasons: death benefit, cash accumulation, etc. Both types of products, when properly designed, are a great place to store wealth and provide retirement income when the death benefit protection is no longer needed. But once you understand the mechanics under the hood, you’ll see the advantage for accumulation goes to the IUL. By unbundled, I mean that the cash value and the mortality charges are made explicit. A Whole Life is more of a Black Box. You don’t see what is going on under the hood. Both types of policies are based on the exact same mortality tables. Permanent life insurance needs to be able to pay a claim some day. Its important to understand that all permanent life insurance needs to be able to pay a claim some day. So how would you do that if you were the insurance company? I’d want to make sure the premiums were high enough that the policy owner would save up their own death benefit over their lifetime given an extremely conservative earning rate assumption. I’d also want to purchase some sort of short “term” insurance that I would keep renewing each year just in case the policy owner dies early. The combination of both of these would insure that I would have the ability to pay the claim whenever needed. This is exactly what happens under the hood of every permanent life insurance policy: WL or UL/IUL. The premiums are simply designed so that the policy owner saves up their own death benefit over their lifetimes. That is the cash value. The insurance companies invest the cash to take advantage of compounding growth over a very long time. Thus you can see that Guaranteed Rate is not a real number. There is not some secret bucket of money to pay those guaranteed rates. If interest rates decline below the guaranteed rates, you are probably going to start seeing insurance companies struggling. It’s simply a worst-case scenario for the insurance company. So, if you were an insurance company and you knew that you had to pay a claim someday, what would you invest in? That looks like 56% in Bonds and another 14% in mortgages. Both asset classes are fixed income with some sort of collateral to back it up. 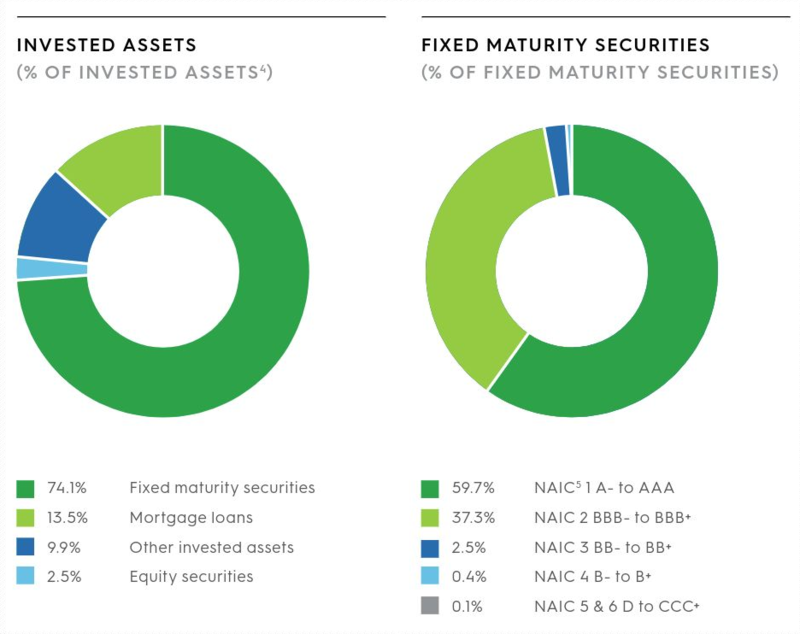 As you can see, these are nice safe, principal protected investments that are unlikely to lose value. They aren’t going to be stellar performers, but all they need to do is beat their worst-case scenario and they will be able to meet their obligations. As you can see, their holdings are actually a little more conservative than Mass Mutual. 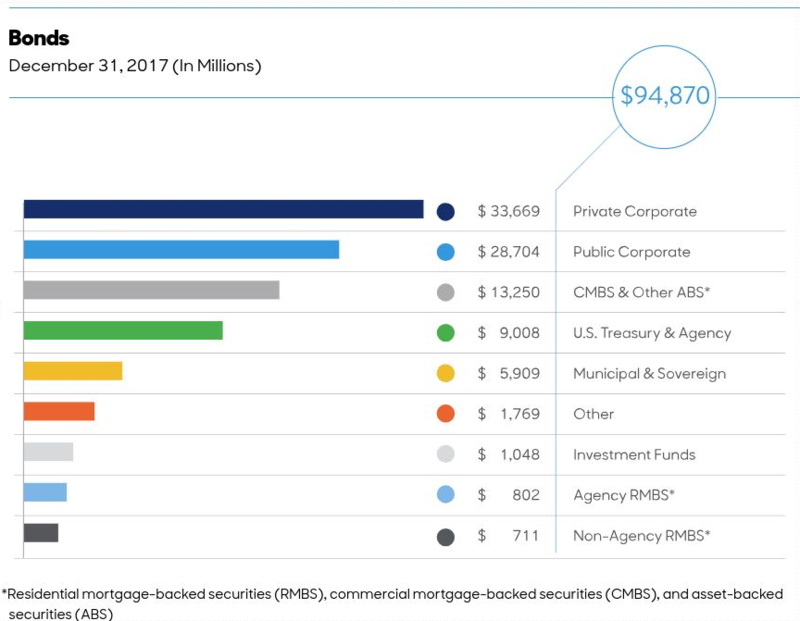 Bonds and Mortgages make up 87.6% of their holdings versus 70% for Mass Mutual. But notwithstanding the slight differences in the asset mix that you’ll find from one insurance company to another, they are all investing in safe, conservative investments that are unlikely to lose value. you should expect that the performance (dividends or interest crediting) to be roughly equal from one company to another. You should not expect the dividend rate of a whole life policy to do any better or do any worse than the underlying debt market in which it invests. So with that said, do guarantees really matter? The guarantee was just their worst-case scenario. They are hoping to do better. Whether there is a guarantee or not, the cash value of all WL and UL policies should have very similar accumulation. So what’s different in an Indexed UL? 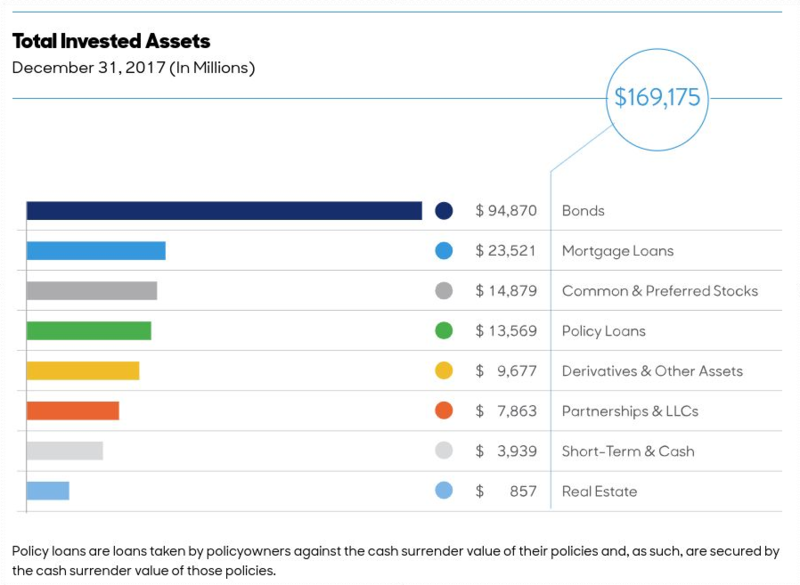 To keep it simplified, the insurance company is simply using all of the interest that it earns investing in these safe, conservative fixed-income investments and they are using it to purchase as much movement as they can get (with the interest they’ve received) in the index options markets. This is why you see IUL’s offering a “Cap” and a “Floor” on their returns. A common IUL interest crediting strategy is one based on the one year point to point change in the S&P 500. Today’s cap rates are between 11-12% as I look around at different carriers. So the interest crediting matches the one year point to point change in the market until the cap is reached. On the other hand, if the markets fall, the options simply expire worthless and no principal is lost. That is the zero percent floor. The policy-owner simply foregoes the interest that they would have received in the fixed interest crediting strategy. When an insurance company lowers the Cap, they are not trying to screw you. The lower cap is simply as much movement in the market as they could capture that year. Everything depends on interest rates (how much money they have to spend) and the volatility of the indices (options prices). They have a vested interest in your cash value growing as fast as possible. Its also important to note that the process is entirely mechanical. Even without the “guarantee”, the interest is what it is. It should exceed the worst-case scenario. But whatever amount of interest there is, it is used to purchase as much movement in the equity markets as they can capture with index options. There is not a board of directors meeting to discuss how much they should pay as a dividend. So what does this mean for cash accumulation? This means that despite the fact that the policy owner’s assets are mostly invested in safe, principal-protected debt instruments, the options hedging strategy allows for interest crediting that is linked to the Equity Markets, not the Debt Markets. The performance is not likely to match the equity markets over a long period of time, but the performance should still exceed the performance of the Debt Markets. See Equity Premium. Did you notice how I haven’t tried to compare “Average Returns” or “Compounding Returns”. Anyone that understands that an IUL allows you to capture a portion of the Equity Premium can see that over time, for two similarly designed policies, the cash value accumulation in an IUL will exceed the cash value accumulation in a WL or UL. I specifically state “similarly designed policies” because most of the articles you will find on the internet try to make false comparisons between policies with different design objectives. See https://www.biggerpockets.com/blogs/7595/47958-is-indexed-ul-or-whole-life-better-for-infinite-banking. So what does this mean for a Policy? Remember the two parts of the policy: Cash accumulation and Annual Term. The cash value of the policy is simply the policy owner saving up their own death benefit over their lifetime. So besides the savings component, the insurance company also has the risk of the policy owner dying early. In a UL you can clearly see that the insurance company is basically purchasing a 1-year term policy that gets renewed each year. In a Whole Life policy you cannot see the mortality charges, but you can bet that this is how they are accounting for the risk of the policy owner dying early. The size of this 1-year term policy must cover the gap between the death benefit and the cash value. Remember, the cash value represents the policy owner saving up their own death benefit. Thus, the risk to the insurance company is the difference between the Cash Value and the Death Benefit. Insurance companies like IUL because the faster growth potential of the cash value reduces the internal cost of the policy because the amount at risk is reduced more quickly. So now that we understand that the basic mechanics are much the same when you look under the hood, which type of policy would you want? Would you want one where the return on the cash value is tied to the returns in the “Debt” markets? Or one where the return on the cash value is more closely linked to the returns in the “Equity” markets? Equity returns should always exceed Debt market returns over the long run. The increased risk requires a premium. The insurance company wants the cash value to grow as fast as possible and as safely as possible. Linking the returns to the equity markets by using options on the indices allows the cash value to earn a higher return while protecting the principal. A UL/IUL simply credits the interest that is earned. A WL dividend rate is based on the recommendation of the company’s directors/executive team. But ultimately, they pay out what they make. Neither company is making money off of the cash value.They both want the cash value to grow as fast as possible so that their risk is removed. The “Guarantee” is really a meaningless number. It’s simply a worst-case that should never happen. A WL and a UL designed the same way will function the same. In an IUL the client understands that the interest crediting is simply a mechanism. That mechanism will generate far higher returns over the long run than a Whole Life. When is a 7% return better than a 10% return?